Roll your dice to determine your actions. Move, treat, take samples, or roll again. Discover the 4 cures before it's too late! Pandemic has always been a favourite of ours, no doubt because it was one of the games that got us into the hobby in a big way. When we heard that they were doing a dice version I knew i would be ordering a copy! This fully cooperative dice rolling version of the board game Pandemic has 2-5 players take on one of the 7 roles, each of which get their own special dice set. During each player’s turns they roll their dice and can reroll trying to get results that let them move, treat, sample, or perform some other special ability. But each time a “Biohazard” face is rolled, the infection rate marker moves up the track. Its position on the track determines the number of infection dice rolled and if it goes to the end of the track, you lose. After every player’s actions, the infection dice are rolled and placed on the 6 regions. If there’s no dice left to draw from the bag, you lose. When too many are placed in one region, an outbreak occurs and they spill over into the next region, potentially causing further chain reaction of more outbreaks. Too many outbreaks and you lose. Diseases are cured by treating infection dice in a region which moves them to the “treatment center” and then by collecting samples from the treatment center. But taking a sample requires you to lock a die with it, thus reducing the number you’ll have to roll next turn! Luckily you can give samples to other players in your region. At the end of your turn you may roll all the collected sample dice of one infection color. If you roll 13 or higher on those dice, you cure the disease. 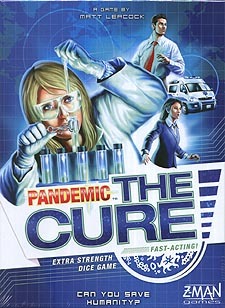 Cure all four diseases to win the game! This is an easy game to play but a very hard game to win. It can get frustrating to play since so much of the game depends on getting the right rolls and having event cards (and dice to buy them) to use at just the right time. It feels very much like Pandemic but set-up is easier and it plays faster. Players need to plan and cooperate together for any hope for a win. A solid addition to cooperatives games with top notch components and a worthy version of Pandemic.